Researchers from FOM Institute AMOLF and the California Institute of Technology have discovered a new method for the generation of electrical potentials using light. With the help of minutely sculpted metal nanocircuits they could effectively capture light and convert it into an electrical potential of 100 millivolt. The research results are published on 30 October in the journal Science. The AMOLF-Caltech team, which has worked together for many years, calls the newly discovered effect the 'plasmoelectric effect'. Albert Polman, leader of the AMOLF part of the team: "This is an entirely new way of converting light into electricity. We have now demonstrated that an electrical voltage can be generated; the next step is to see whether we can also collect electrical current and generate electrical power." Small particles of precious metals such as copper, silver and gold are known to emit colourful spectrums if they are illuminated. A well-known example is stained-glass windows in old churches in which the colours are formed by small metal nanoparticles that have been enclosed in the glass. The light that shines on these particles is converted into plasmons: oscillations of the free electrons in the metal. That results in strong absorption and diffraction of certain colours of light. 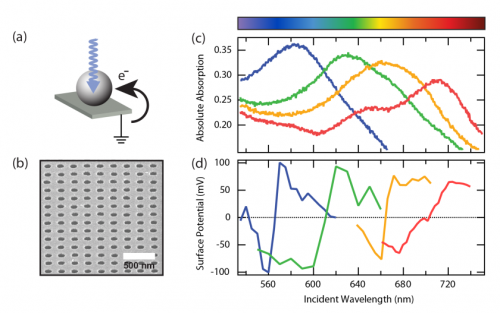 The AMOLF-Caltech team investigated this light absorption process in artificially created metal nanostructures. They manufactured these with the help of modern clean room techniques. They illuminated gold nanospheres with light and discovered that a negative electrical potential arose when these spheres were illuminated with blue light. Conversely, they discovered a positive potential in the case of red light. The researchers measured the electrical voltage using an ultrasensitive needle that they placed above the illuminated nanoparticles. Inspired by this initial result the team manufactured metal nanocircuits, consisting of a square matrix with miniscule holes with a diameter of 100 nanometres in a thin gold film. 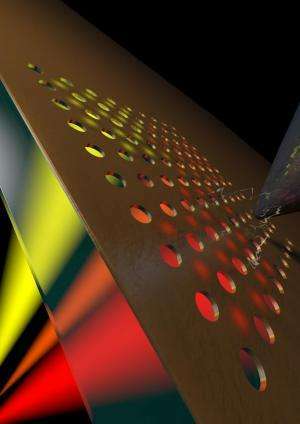 Just like the nanoparticles, these matrixes exhibited clear plasmon resonances, for which the distance between the holes determined the colour. If the circuits were illuminated with a laser and the colour of the light was gradually changed from blue to red, first a negative potential arose (-100 millivolts, blue light) and subsequently a positive potential (+100 millivolt, red light). The researchers subsequently developed a theoretical model with which the phenomena measured could be well described. The incident light elicits small temperature fluctuations that provide a thermodynamic force for the exchange of electrical charges on the switch. That results in the potentials measured. The newly discovered plasmoelectric effect. (a) Schematic representation of a metal nanosphere that becomes electrically charged when illuminated with light. (b) Electron microscope image of the metal nanocircuit made up from a matrix of ultra-small holes in a thin gold film. (c) Optical absorption spectra measured for metal nanocircuits with varying distances between the holes (175, 225, 250 and 300 nanometres). (d) Electrical potential of the nanocircuits in (c), as a function of the wavelength of the incident light. The potential measured varies from -100 millivolt to +100 millivolt as the wavelength changes from blue to red light. The conversion of optical power to an electrical potential is of general interest for energy applications, and is typically obtained via optical excitation of semiconductor materials. Here, we introduce a new method using an all-metal geometry, based on the plasmon resonance in metal nanostructures. In arrays of Au nanoparticles on an indium-tin-oxide substrate and arrays of 100-nm-diameter holes in 20-nm-thick Au films on a glass substrate, we show negative and positive surface potentials during monochromatic irradiation at wavelengths below or above the plasmon resonance respectively. We observe such plasmoelectric surface potentials as large as 100 mV under 100 mW/cm2 illumination. Plasmoelectric devices may enable development of entirely new types of all-metal optoelectronic devices that can convert light into electrical energy.